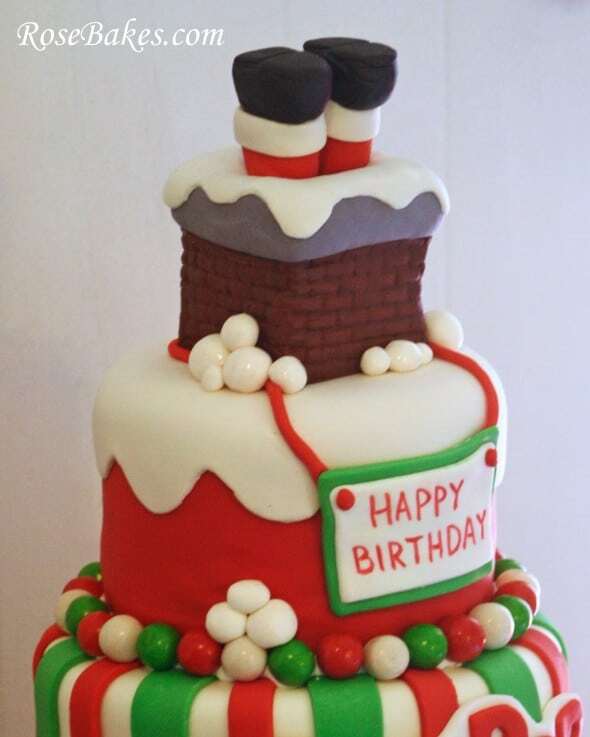 I had so much fun doing this “Santa Stuck in the Chimney” Christmas birthday cake. Not so much because of the topic – but mostly because of the birthday guy! PopPop was celebrating his 88th birthday and his daughter wanted to make his birthday fun and special for him! Since losing my MawMaw early last year, time has become even more precious to me than ever before. And I’ve really come to value and appreciate the elderly people that are in my life. So a daughter – doing this for her dad… it touched my heart! I’m not sure what a “typical” or “appropriate” cake would be for a man at the wonderful age of 88, but this didn’t seem typical. However, it was fun and bright and full of life – and that was very appropriate for celebrating a long blessed life! So anyway… here’s my version of a Santa Stuck in the Chimney Cake! For the bottom tier, I did stripes similar to the Gingerbread House Birthday cake, minus the pink and wavy edges. I used my favorite FMM Multi Ribbon Cutter to do those. 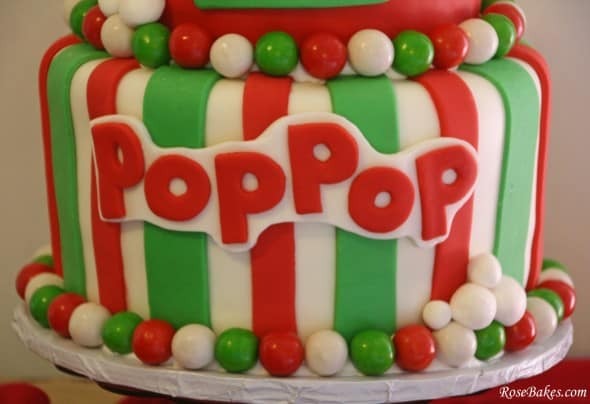 For PopPops name, I used the “P” from my 1.5″ Alphabet Cookie Cutters and I used round cookie cutters to make a custom “O” so that I’d get the illusion of upper and lower case letters! For the top tier, I did it with the fondant overlay technique I showed you yesterday (also done on the Gingerbread House Birthday cake). Then there was the topper. For it, I made a pan of rice cereal treats, let them completely cool, then cut out 4 with my square cookie cutters and pressed them together, one on top of the other. I packed them down pretty tight so I’d have a very solid chimney! To get the rimmed edge, I cut out a square one size larger, then used a smaller square to cut out the center – so I’d have a place to put Santa’s legs. I textured the fondant on the outside with a brick textured fondant mat. 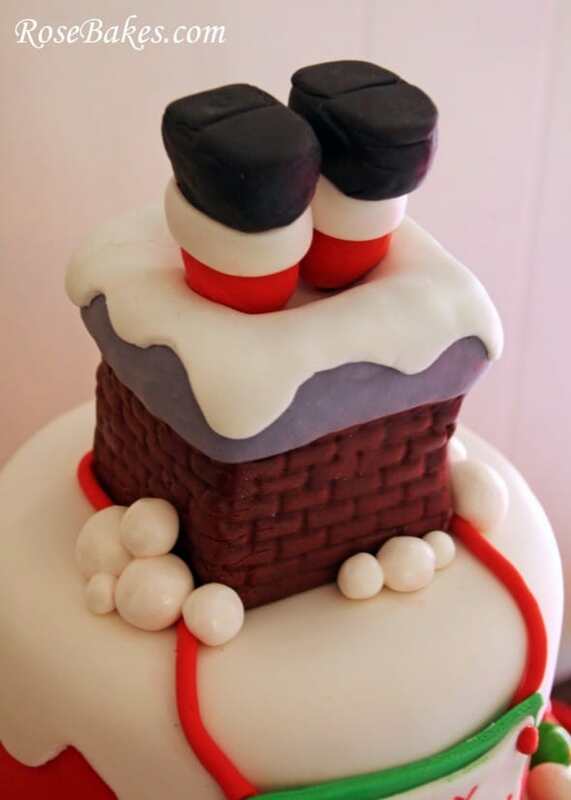 Santa’s legs were made entirely out of fondant – some Satin Ice Red Vanilla fondant, some Satin Ice Black Vanilla fondant, and some homemade marshmallow fondant. The legs were formed around lollipop sticks, then inserted into the rice cereal chimney. I doweled the whole thing together (you can see how I stack cakes here), then added the royal icing with gum balls border. 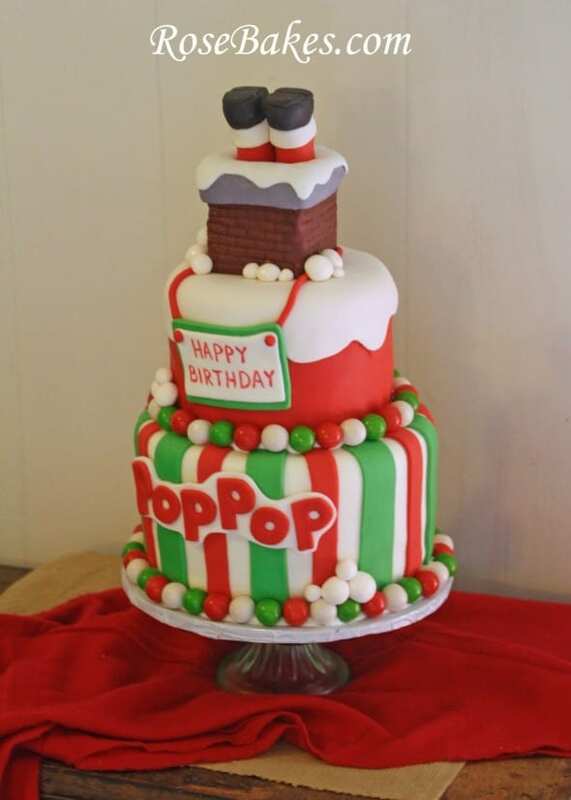 This cake was 6″ and 8″ rounds – the top was strawberry cake with strawberry buttercream and the bottom was chocolate cake with chocolate buttercream. 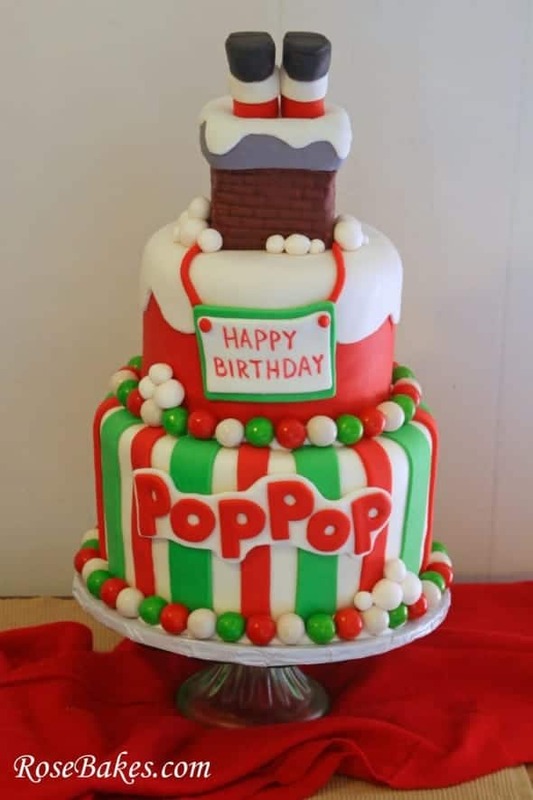 The cake was decorated with homemade marshmallow fondant for all the colors except red – it was Satin Ice Red Vanilla fondant. For the “Happy Birthday” sign, I used my Americolor Food Markers. 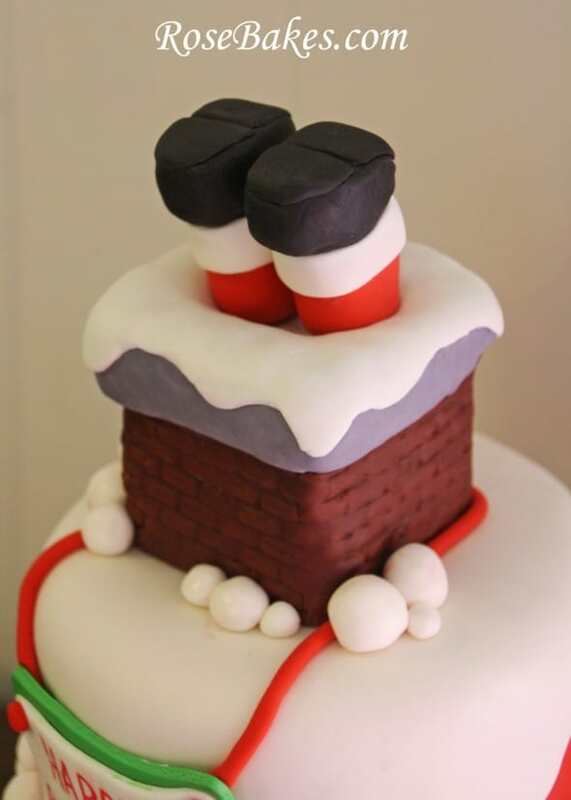 Don’t forget to have a peek at my other Christmas cakes and check out all of my Christmas goodies on Facebook! Did I miss any details? Do you have any questions about this cake or cake pops? Please leave them in the comments and I’ll do my best to answer and help out! 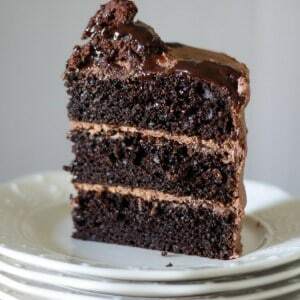 These cakes are looking yummy and very delicious. i am very interested in buying one of your cakes for my sons birthday party, i have heard nothing but great things about you guys! If you’re local to me (around Meadville, MS), then you can email me (rosebakes at live dot com) with details, design, number of servings, and date and I’ll let you know if I can do it. IF you’re not local, I can’t ship or deliver cakes anywhere outside my local area. ok, i am not a local but thank you very much! everything looks amazing. Rose, this is a wonderful cake. I would like to know did you free hand the writing on the Happy Birthday Cake sign? I have to do really small letters on some puzzle pieces for an adoption celebration. And wasn’t sure to try to free hand it or find font to copy the letters on to the fondant. The puzzle pieces are very small I even thought about just cutting them a little larger than the cutter. What would you do if you don’t mind helping me with this? Its going to have all buttercream that’s what they asked for and I was going to use homemade fondant for the puzzle pieces but, not sure how long it will take for them to set up they will be some on the side of the sheet cake that are plain then on top flat down with the writing on them? I freehand wrote the sign with food markers.